Nickname(s)"Big Al The Tanker's Pal"
Gray was born on June 22, 1928 in Point Pleasant Beach, New Jersey, where he was raised. He is the son of Emily and Alfred Mason Gray. 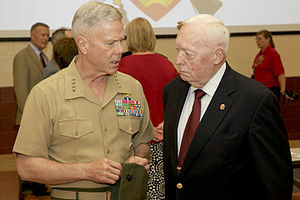 Gray presided over changes in training in the 1970s with an emphasis on large-scale maneuver in desert and cold-weather environments, and changed Marine doctrine to one of maneuver warfare in the 1980s. This transformation from the Vietnam era is sometimes called the second enlightenment of the Marine Corps (the first being under MajGen John A. Lejeune), and included development of a robust maritime special operations capability, emphasis on the education of leaders, establishment of Marine Corps University, and development of a long-range desert operations capability. As a reminder that the primary role of every Marine is a rifleman, he had his official photograph taken in the Camouflage Utility Uniform, the only Commandant to have done so. The Columbia Group, a privately held technical services support company that serves the U.S. military. GlobeSecNine, a privately held financial investment firm. Integrity Applications Inc., a privately held information assurance and security company. Norwich University board of trustees. 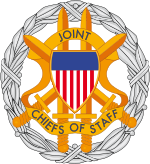 "Nomination of Lieutenant General Alfred M. Gray Jr. To Be Commandant of the Marine Corps". Ronald Reagan Presidential Library. June 16, 1987. Retrieved 2007-05-25. "Profile: Alfred M. Gray, USMC". Forbes. 2008. Archived from the original on 8 December 2008. Retrieved October 26, 2008. "Alfred M. Gray". Marquis Who's Who (fee required for BRC). Reproduced in Biography Resource Center. Farmington Hills, Mich.: Gale, 2008. 2008. Document Number: K2016616305. Archived from the original on January 12, 2001. Retrieved October 26, 2008. "General Alfred M. Gray Jr.". Who's Who in Marine Corps History. History Division, United States Marine Corps. Retrieved 2010-12-29. Cushman, John H. Jr. (June 5, 1987). "Activist General in Line for Top Marine Post". New York Times. Retrieved March 14, 2009. "Marine Corps Order 1650.47" (PDF). Retrieved June 30, 2017. "General Alfred M. Gray, (Retired USMC)". American Public University System. 2007-05-08. Archived from the original on 8 December 2008. Retrieved 2008-10-26. "General Alfred M. Gray, Chairman of the Board of Regents at the Potomac Institute for Policy Studies, is Inducted into the Hall of Honor at the National Cryptologic Museum" (Press release). Potomac Institute for Policy Studies. November 25, 2008. Retrieved December 13, 2008. "General Alfred M. Gray – Retired, 29th Commandant of the Marine Corps". United States Marine Corps. Retrieved January 23, 2009.